The Journey Prize - Canada's biggest and most lucrative annual short story award - turns 30 this year and I was fortunate enough to be on the jury along with authors (and all around wonderful human beings) Kerry Clare and Zoey Leigh Peterson. The long-listed authors and their stories will be announced on Tuesday, August 7th. Watch this space. In January/ February, magazines and publications choose up to three of the best stories by emerging authors that they published in the previous year. The stories are sent to McClelland & Stewart who administer the award (not to be confused with the Writer's Trust of Canada who give the award out and are responsible for the hoopla surrounding the ceremony). It's actually my Canadian editor Anita Chong and assistant editor Joe Lee who do much of the thankless, painstaking, administrative work. They are stars. M&S hires the jury and we all read every single one of the stories. And then we the jury discuss and debate and re-read and re-consider and eventually we narrow it down to the long-list, all of which are published in the Journey Prize anthology. I'm so pleased for these authors because I know what it means to make the anthology. And it's a gold star for the publications that nominated them too. Let's take a moment to tip our hats to those magazines and literary journals - staffed mostly by volunteers working long hours on shoestring budgets. They are the corner stone of Canadian literature, the first rung on the ladder and their existence makes so many of our careers possible. I lucked out with my fellow jurors. Kerry Clare (who has written about her Journey Prize experience here) and Zoey Leigh Peterson are careful readers and came to the job with a spirit of openness that made healthy and respectful discussion and debate possible. We listened to each other. We kept open minds. None of us assumed we knew better. We gave the job the respect and attention it deserved and were willing to re-read. Over and over and over. The things Kerry and Zoey taught me about reading, are lessons I carry with me today. They have made me a more thoughtful reader and probably a better writer. And I'm proud of the anthology we curated. Journey Prize 30. It's a stunner. Sleep is important for health and sanity of course but it's also crucial to the creative process. If you don't believe me, just listen to this recent episode of Hidden Brain and pay attention to the anecdote about how Keith Richards wrote the song "Satisfaction." Short stories are highly underrated which is really too bad because I think they have the power to teach us more about craft than any other form. I have a bad habit of reading collections I love fast, just gobbling them up, story after story without pause. It wasn't always like this. When I was first learning to write, I'd read a story slowly then again and again. I'd think about all the different elements - character and plot and pace and ponder the ending, why it worked or didn't, and whether I would have written it differently. Slow, methodical reading can be so satisfying, like putting a single square of dark chocolate on the tongue and allowing it to dissolve. I want to do this more. And also, I want to read short stories more consistently. So I'm aiming for one a week and when I find one that really speaks to me, I plan to read it over and over and think about it slowly. Today I read Carmen Maria Machado's "The Husband Stitch," which is the first story in her debut collection Her Body and Other Parties. I've read the story before and it has that fantastic depth and texture that the very best stories contain. There's so much going on beneath the surface of the story. It demands re-reading. It demands slow and thoughtful consumption. This week, I plan to give it both. As a reader, I'm always behind the times, getting round to books two or even three years after they are published. But being a professional writer means being asked to recommend and talk about new reads. Last year by total fluke I happened to read a bunch of the newest books (Son of a Trickster, The End of Music, Brother, All Is Beauty Now, Bellevue Square....to name just a handful) which came in handy. This year I plan to be more purposeful. So far my list includes: Exit West by Mohsin Hamid, Neel Mukherjee's latest A State of Freedom, Mary Beard's Women & Power, Machado's debut mentioned above, Zadie Smith's new essay collection, Feel Free, Kim Fu's The Lost Girls of Camp Forevermore, The Widows of Malabar Hill by Sujata Massey, and That Time I Loved You by Carrieanne Leung. That's for starters. I won the Journey Prize! It's two days later and I'm still floating on air. And check out this Globe & Mail top-of-the-fold, front section, page 4 coverage with my photo! Back when I worked in media relations, I would have killed for this kind of national placement. Here's the full media round-up: local arts and culture newspaper The Overcast, CBC Books, The Toronto Star, National Post, and Quill & Quire. 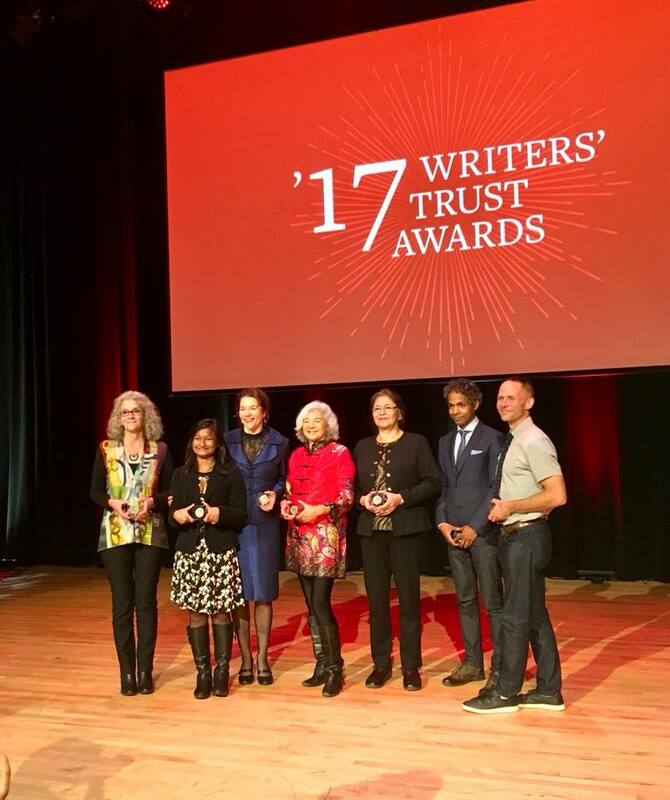 The Journey Prize was announced along with six others as part of the annual Writers' Trust Awards on Tuesday, November 14 at the Glenn Gould Studio at CBC HQ in Toronto. I was especially pleased for David Chariandy who won the Fiction prize. His novel Brother is a quiet lyric, an elegy to Scarborough, and a meditation on grief, brotherhood, and prejudice. The Writers' Trust are genuinely wonderful people who a) know how to pull off an awards show and b) know how to make writers feel loved. They feted all us finalists the evening before at a private dinner and then on Tuesday night put on a really slick awards night that felt a tiny bit like the Oscars. They even live-streamed the event so you can watch me stutter through my acceptance speech. It was such a treat to dress up and socialize with other writers, a couple of whom are my literary heroes and of course Tuesday night was a total whirlwind, especially after I won. I've never been hugged by so many new acquaintances in my life. For the record, I liked it. :) I was chuffed to see Pamela Mulloy, Fiction Editor for The New Quarterly. TNQ is such an amazing publication and they've been so supportive of my work so it was an added pleasure not just to win, but to bring this prize home for them as well. Here are some photos from the evening, none of which came from my camera. From left to right: Group photo of the award winners; Journey judge Ayelet Tsabari with fellow finalist Darlene Naponse and me; Journey judge Kevin Hardcastle and me; TNQ editor Pamela Mulloy and me. Two of my stories have been long-listed for this year's JOURNEY PRIZE. TWO! They are: Butter Tea at Starbucks (originally published in The New Quarterly) and Reading Week (originally published in PRISM international). 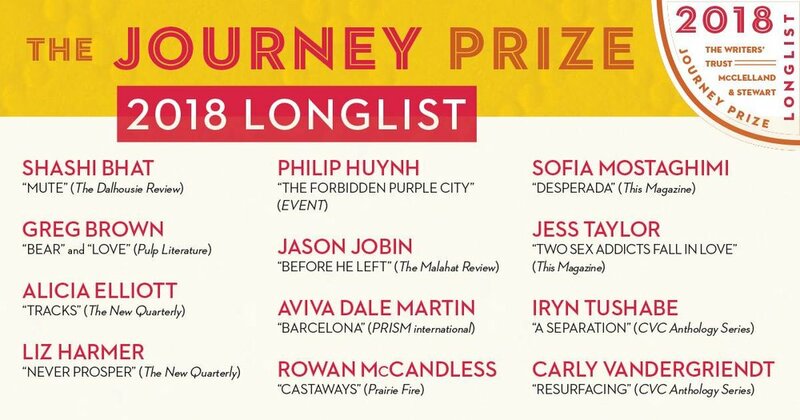 The Journey Prize has been on my writer's bucket list for a while so I was pretty happy back in January when both publications said they were putting my stories forward. My live-in mathemagician (every writer should have one) crunched some numbers and told me I had a 60% chance of getting one story on the long list and a 20% chance of getting them both on there. Take that, slim odds! The long-listed stories get published in a collection - Journey Prize 29. You can pre-order it here. Finalists are announced in the Fall and the winner is named in November. HOORAY FOR CANLIT! Antonya Nelson reading "When we were nearly young"
People are always saying they have no time to read. So here's the solution: The New Yorker Fiction podcast. Writers are invited to read a story - written by someone else - from the magazine's archives and afterward, the reader joins Fiction Editor Deborah Treisman to discuss the story. The conversation is always on point but the stories themselves can be hit or miss (everyone has different tastes, right?). But a recent episode in which Ben Marcus reads Mary Gaitskill is a definite hit and worth a listen. It's one of those stories that will make you want to stop what you're doing and really pay attention. I'm always, always, looking for writing advice. Is this because I haven't got an MFA? Or because I'm a master procrastinator? Both? Either way, I recently found these gems from an old interview with Lorrie Moore. So I'm always on the look out for easy tricks and here's one from Lorrie Moore: take something from the middle of the story and move it, out of order, to the end. My story, Butter Tea at Starbucks, is out in the most recently issue of The New Quarterly (issue 140). The story is set in 2008 in the lead up to the Summer Olympics in Beijing. It's about sisters and postpartum depression, the politics of Tibet, and the excruciating uncertainty of quarter life. But it's also about fire and water, circles and balance. Butter Tea took a long time to write and rewrite (and write and rewrite and write and rewrite and write and rewrite) but I'm really proud of how it turned out. The format doesn't matter too much. Submitted. Rejected. Accepted. That's all you need. Create the spreadsheet as soon as you start sending your work out. That way, when the replies come in, you'll have a place to tally them up and something concrete to do. The act of filling in the boxes can be analgesic. You read the rejection. You fill in the spreadsheet. Decide if you need to revise the story. If not, because you can see at a glance which publications haven't seen the story yet, you can re-submit right away. The goal is to have as few stories in the rejected section as possible. Recently, I began jotting down alternative publications beside each submitted story. I highly recommend this approach. It makes re-submitting even more automatic and leaves zero time for brooding. Writers! If I can give you one piece of advice: stop feeling sorry for yourself. That is precious time when you could be writing, editing, submitting, reading or binge watching Orange is the New Black. Eventually something will stick. A story will be accepted and then you can move it to the "published" section of the spreadsheet (keep it visible, close to the rejected list). This is important because you can see over time how stories graduate from rejected to accepted. And keeping track of which publications rejected the stories will also help you see the truth: that taste is subjective. Just because a story is rejected doesn't mean it's worthless. Sometimes, yes, the story needs work. And if a rejection comes with feedback, consider it a gift. But often a rejection from one publication is only that: a rejection from one publication. The spreadsheet speaks the truth. Look at all those acceptances! Look at all those rejections! Being a writer means being rejected. So go send your work out, go court rejection.